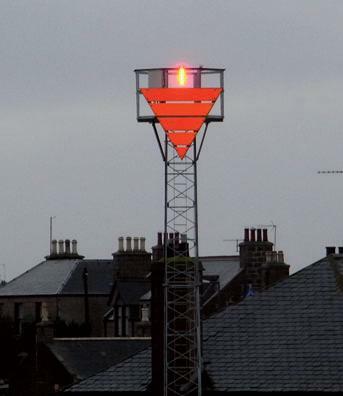 Coloured sector lights are often used on the approach to a port or harbour to indicate dangerous areas. Typically if the vessel is in the white sector it is in safe water. If the colour, as seen from the vessel, changes to red or green, it implies the vessel may be running into danger. Wide angle sector lights allow a navigator to see at a glance which sector he is in, relative to the light. They are used where a navigator doesn’t need to know precisely where he is, just which sector he is in. The Vega VSL-73 wide LED sector light is suitable for use where the smallest sector is greater than 3 degrees. It can be configured for multiple colours (red, white, green) and sector angles with a range up to 10Nm. Where the vessel needs to be precisely positioned within a channel, a pair of leading marks can be used to define the line that the vessel should follow. 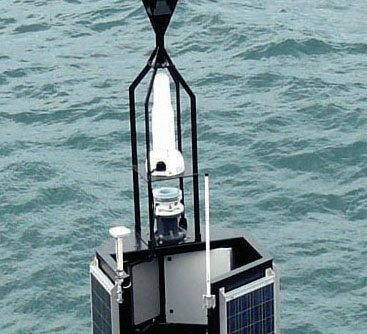 Leading marks usually consist of a daymark structure large enough to be seen at the required distance in daylight with lights only for nighttime use although sometimes the daymark is lit during the day for added emphasis. The Vega VLL-43 LED Leading Lightlinear directional light specifically designed for this purpose with a range of up to 0.75Nm in daylight and 11Nm at night. If flashing lights are being used then synchronising these can be an effective way of making them stand out. This can be achieved either by using the Vega VSU-29 GPS sync unit, or using a light with a built in GPS synch unit, such as the Vega VLB-67 or VLB-36. There are situations where a pair of leading marks is impractical and costly. Precision sector lights allow a narrow channel to be defined by just one light. Hydrosphere recommends two lights for this type application. The Vega VLS-46 LED Sector light – a compact, lightweight light with low energy consumption and minimal maintenance – can be solar powered, and mounted on a less substantial structure than that required by a heavier light. PEL Sector Lights can be used when more accurate boundary resolution or greater range is required although their use of incandescent bulbs means they consequently require more power than a LED light. PEL Sector Lights are very accurate on both the sharpness of the colour change and the actual position of the sector boundary. The PEL has two model groups; the PEL-3 is primarily intended as a nighttime light, with a night range of up to 19Nm and day range of up to 3Nm. The PEL-6 can support up to 21Nm in the coloured sectors and 25Nm in the white sector at night and up to 6Nm in daylight with a favourable background. For additional information please refer to the product and services section of this website, or contact Hydrosphere to discuss your requirements.